Israel's political party conventions make the Knesset seem polite and tame. At the Likud Central Committee convention the other day, the vote for PM Netanyahu's proposal for the Likud and Yisrael Beiteinu to run together in the upcoming election was conducted by a "show of hands" popular vote. Not the best way to hold a vote (see the yellow piece of paper I had to wave in the air for my vote to be "seen"). The Likud's Central Committee has seen its share of excitement...and routinely gets blasted by the media for being less than perfect. I'm not sure its refreshing to see the Labor party's Central Committee behaving similarly -- and of course you won't see this video written about in Israel's mainstream media. I guess all the parties are the same. Seen here is Labor Central Committee member, Michal Gur, being thrown out of the convention. She was promised a chance to speak about the lack of dedicated spots for women MKs on the Labor list. Seems like Labor borrowed some of the goons that Omri Sharon used to use when his father was head of Likud. This post is dedicated to the self-proclaimed "liberalis" in Modi'n (which isn't all of Modi'in, there are lots of normal and sane people living there as well). The liberalis, who live in Occupied Modi'in should read up on their good friends from Fatah (the good guys in Palestinian Authority) -- the following is from the "fascist" group, Palestinian Media Watch. and you will go to your death,"
"My mother dressed me in a strange belt (i.e., a suicide belt). I kissed her hand and said to her: 'Keep it up, mother, for you and for Palestine I will kill the impure and the damned.'" The Facebook page states that it is "the official page of Fatah's Information and Culture Commission in Lebanon," and is linked to from the official website of the Fatah Information and Culture Commission (www.fatehmedia.ps). "How do you know that you're a Palestinian?" "If you know that you were born with a death sentence, and if you go to your death without caring - then you're a Palestinian! If your song is the song of Martyrdom (Shahada), and death, for you, is birth - then you're a Palestinian! If you love death, and you say the Shahada [declaration] (i.e., the Islamic creed: "There is no God but Allah, Muhammad is Allah's messenger.") aloud - then you're a Palestinian! If you've ever felt that you're an exploding body and that your soul will long one day to be a knight for the homeland - then you're a Palestinian! If the stone is your weapon against oppression, and if those who hate [you] criticize your struggle - then you're a Palestinian! If you have saturated the tree of the homeland with your free blood, with love, and have offered the remnants of your bodily parts as a bridge for those who are yet to come - then you're a Palestinian! If you have shattered the chains, and carried the key to the house from which [your] grandparents were expelled - then you're a Palestinian! If your wedding (i.e., a Martyr's funeral in Islamic tradition is a wedding to 72 Maidens of Paradise) was amidst a hail of bullets between the shoulders of friends [who carried your body], against the sound of tears mingled with joy (i.e., of achieving Martyrdom) and the searing pain of separation- then you're a Palestinian, and you're full of pride at being a Palestinian." ACRI Slams Modi'in: Stop illegal policies against Chareidim. Today (October 30) the Association for Civil Rights in Israel (ACRI) sent a letter to the Mayor of Modi'in, Haim Bibas, demanding that that he terminate the city's policy of restricting entrance to the Anava River Public Park during parts of the year. The municipality of Modi'in-Macabim-Reut enacted the policy – which prohibits nonresidents from entering the park during the summer months and on holidays - prior to the festival of Sukkot in October. Despite the official rationale for the policy – overcrowding in the park – the municipality's actions raise a suspicion that its true purpose is to exclude Orthodox Jews from neighboring Modi'in Illit. This is not the first time a local authority has tried to restrict entry to public parks. In 2000, the Israel Union for Environmental Defense filed a petition against the Ra'anana municipality after it began charging nonresidents an entrance fee at one if its city parks. Following the petition, the national law was amended and a clear ban on charging entrance fees to public parks was established. Further discussions in the Knesset emphasized that the purpose of the amendment was to regulate access to public parks for the enjoyment and benefit of the public at large. Some months ago, ACRI wrote a letter to the municipality of Kiryat Ata, after learning that the city was charging nonresidents entrance fees at its public park. In that case, the suspected purpose of the policy was to prevent the entrance of Arabs from nearby communities. The letter to Mayor Bibas, written by ACRI Chief Legal Counsel Dan Yakir, warns that the restriction is illegal; it violates the right to equality, and in practice constitutes prohibited discrimination against a religious group. Although the municipality procured a legal opinion from Professor Ariel Bendor that sanctions the policy, ACRI disagrees with the opinion's conclusions. Attorney Dan Yakir: "The fact that the park was built on municipal land does not mean that the municipality can do whatever it wants with it. Public space, such as this park, is designated for the public at large. It is unacceptable for local authorities to attempt to restrict the public's ability to access parks under their control. " As Israel's front-running Hellenist city, Modi'in is slammed from an unlikely direction - Israel's Civil Right's organization, ACRI. Granted ACRI doesn't have the best objective agenda, and their voice was loudly missing when it came the Disengagement in 2005, but they are to be praised for doing the right thing when it comes to Modi'in. And while we're on the topic of the Hellenist city, a friend of mine started getting Halloween orders for food...from multiple residents of...Modi'in. I guess caroling isn't enough. However, one must keep in mind that living in Modi'in is still far better according to the Talmud and the Rambam, than living in the holy cities of Brooklyn, Monsey or Lakewood. For those not following along at home, my fair hometown of Modiin has barred non-residents from visiting its spacious and beautiful Anabe Park during vacations and on Hol Ha-Mo'ed. This is a result of a pishing contest between Modiin's Mayor Haim Bibas and Modi'in Ilit's Mayor Yaakov Guterman, plus it plays into a strong anti-Haredi (and occasionally anti-religious) sentiment amongst a minority of Modiin residents (a political party, Modiin Hofshit, ran on an anti-religious platform and got only a few hundred votes for city council). As the argument continued, a Modi’in resident, Eli Fischer, decided to see whether everyone was really being barred from the park, or only those in ultra-Orthodox garb. “He’s my guest, let him in,” said Fischer, in an effort to help Tirnauer, at first without success. The guards checked Fischer’s identity card, and then started questioning Tirnauer and his family about their relationship. One of the ushers called a municipal security guard to help. “He’s not really your guest, he’s here to make a provocation,” the security guard told Fischer. But Fischer persisted after the getting approval of his superiors the security guard allowed Fischer and his new acquaintances into the park. The municipality said that the confrontation involving Tirnauer and Fischer was the first to occur since the instructions were issued, claiming it was a planned provocation by the media. “During all the days that entrance to the park was restricted, there wasn’t a single incident, except for one in which a visitor who isn’t a city resident came with a reporter to create a provocation and get a headline,” the municipality said. 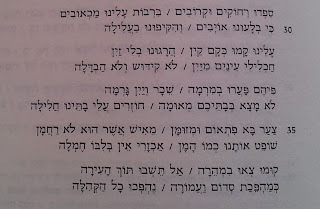 The Hebrew version also includes a Gemara that I cited for the benefit of the reporter, from Sukkah 27b: "All Israel are fit to dwell in a single sukkah." The 11th of Marcheshvan marks the traditional anniversary of the passing of Rachel Imeinu (the Matriarch Rachel). For centuries, Jews have prayed in Bethlehem at Kever Rachel (Rachel's Tomb), a symbol of the Biblical promise of the Jewish return to their homeland. In 1945, Yaffa Tevuah was a 22 year old Lehi fighter imprisoned by the British in the women's prison in Bethlehem. While being taken back and forth to Jerusalem for questioning at the British Police headquarters, she passed by Kever Rachel and recognized the landmark from pictures that hung in her home as a child in Moldavia. Seeking courage when facing her British interrogators, she drew strength from Rachel Imeinu and comfort from her sense of returning home. A year after the Crusaders captured Jerusalem, they turned to conquer Israel's coastal cities. 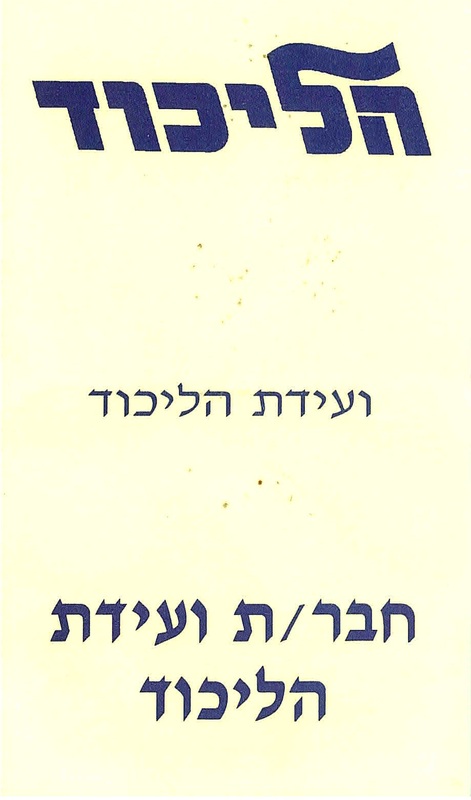 Haifa's Jewish community is mentioned in the Genizah documents. The city was one of three forts (מבצר) that we know of - Haifa, Dan (Banias) and Rafah (Rafiah). Each had a major Jewish community. Haifa was probably mostly Jewish, if not exclusively so, with a small Muslim military presence. In the mid-11th century, Haifa was visited by the Persian Nasir Khusraw. He described the town's shipbuilders who built a local brand of boat named 'Judi'. In the 1070s, following years of internal Muslim battles, Jerusalem was conquered by the Seljuq Turks. The security situation turned dire and the Israeli Yeshivah moved to Tyre. In 1082/4, the Israeli Gaon came back to the Land of Israel and conducted the Hoshana Raba ceremony in Haifa. The story of Haifa's conquest, in the summer of 1100, is reported by Christian chroniclers. An anonymous Venetian monk writing in the early 12th century tells us that Haifa stood in 'God's way' and that the pagans (ie, Muslims) trusted its fortifications and its 'important residents' to withstand the Crusader assault. So who were those residents? The Crusaders first proposed the residents convert. They promised them they wouldn't pay more to the Christian kings than they're currently paying the pagans. Haifa's residents refused. Your crucified God, in which you believe, never entered this city, and neither did his students. You stupid cowards will never conquer it bravely! The kings of Persia and Babylon [meaning Egypt] put this city under siege, with armies far greater than yours, and could never conquer it, and how will you do so, when you are so few and so foreign in your religion? Neither your God nor any other can submit us to their faith; we do not worship a God worshiped by others, and we do not submit to a prince of flesh and blood, and we only keep the faith we choose. The monk's description of the city's residents ("enemies of the Cross", the "Anti-Christian city") is similar to that used for Jews in that era. A more direct reference is found in the account of historian Albert of Aachen. He writes how Tancred, the Norman leader of the Crusades, together with Venetian forces, surrounded Haifa from sea and land and put the town under siege. But when the Norman knights approached the walls with their heavy siege machine, the Jewish residents stood armed on the walls. For fifteen days they fought against the attackers, leaving the Crusaders with heavy casualties, until the Christians withdrew. Patriarch Daimbert came to console Tancred, who was jealous that Haifa was already promised to a different knight. Daimbert told him that it would be a disgrace to the Crusader efforts if the city, defended so valiantly by the Jews, will not be conquered. He promised Tancred that the city will be given to whomever conquers it. Tancred charged the city again. The Jewish defenders, together with the Muslim troops, stood bravely against them. They hurled boiling oil and tar down on the Christian attackers. But as the battle progressed, the defenders suffered fatalities and those remaining realized they couldn't win. They defenders fled and with them the rest of the city's residents. Whoever was caught by the Christians was killed. After a month-long battle, the Jews of Haifa lost the battle and the city was conquered by the Crusaders. As the anonymous monk puts it: Haifa was conquered, and for the first time ever, submitted to the rule of Christ. Under Crusader rule, the city became a Christian-Muslim town. The shipyards were never rebuilt. Classic Story received from friend of the blog, AS. I flew to Tampa, Florida a few weeks ago for the Republican National Convention. When I arrived, I was escorted into a large room where all the Convention speakers of the day gathered along with Congressman, Senators, Governors and other politicians. A woman approached me, stared at me, and then asked "Who are you??" I responded politely, "I am Meir Soloveichik.". "Are you from Florida," she asked. "No," I said, "I am from NY". She looked puzzled and confused, which I found confusing, since I figured most people knew there were a lot of Jews who lived in NY. Anyway, she smiled and walked away. She then approached me again just a few moments later with her husband. She said to me, "Meir Soloveichik -- I'd like to introduce you to my husband, Congressman Walker." The Congressman and I shook hands. A PLO official called on Sunday for international observers to protect Palestinian olive farmers and their groves, after more than 450 trees were vandalized last week as the harvest began. “We urge every country with a diplomatic mission to Palestine to dispatch observer teams to Palestinian olive groves in order to discourage attacks by settlers and to document any abuse that occurs,” PLO Executive Committee member Hanan Ashrawi said. “Given Israel’s support for the settlers and its refusal to allow the Palestinian Authority to provide protection through the occupied territory, the Palestinian people require international intervention to ensure their security,” Ashrawi wrote. Everything the PLO says needs to be taken with a few grains of salt...especially, when this video was provided today by the Shomron Settlement Council, taken today - of Palestinians and a Leftwing activist actively cutting down a Palestinian Olive Grove (what better way to demand international observers). Too bad for them we caught it all on video. Not that Ashrawi cares, as long as she can blame the evil Zionist Joos. We're now entering the period when we begin to pray for rain. Lack of rain was often an excuse to persecute the Jews, specifically those living in Jerusalem. There are quite a few examples from our history of this rain libel, which was very often linked to the 'sin' of drinking wine. Martin Kabátník, a Czech-Bohemian pilgrim who visited Jerusalem in 1491, reported that when there's a drought, the Arabs go to the Jews and Christians and break their wine vessels. Then they break all other vessels they find. And they blame them, that because of them G-d is preventing the rain from coming, because they're infidels and drink wine. Kabátník said he heard from the Muslims that it's OK to wrong the Jews, since G-d doesn't see it as a sin. A few years later, in 1495, a student of the Bartneura repeated the same story: when there's no rain and the water is gone from the waterholes, the Ishamaelites will sometimes gather on us, to pour out the wine and break the jugs because they said that rains don't come because the Jews sin and drink wine. Around 30 years later, after the Turks conquered the land, Rabbi Moshe Basula came to Jerusalem. And he discovered things hadn't changed. He writes as follows: It's the custom of the Ishmaelites in Jerusalem, that when G-d doesn't make it rain, they say it's the fault of the Jews who drink wine, and they ask the governor to break the wine-jugs of the Jews. And on Wed. 20th of Kislev 5282 [Nov 20, 1521] the governor claimed that libel, until they agreed on (a fine of) 200 dukats of their currency, every dukat is 4 marcellis. They fined anybody who made wine, and it cost half a dukat, that is 2 marcellis, for every 100 rotiol of wine, which are 600 of our liters. 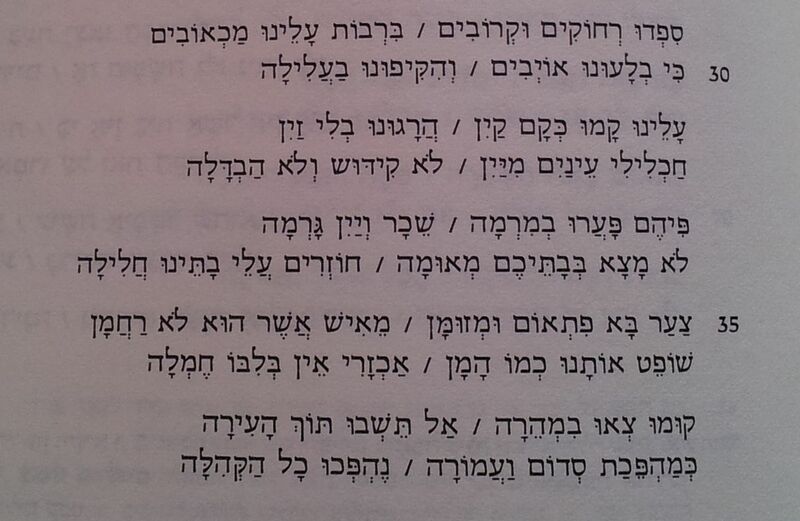 A Jewish poem tells us of similar problems twenty years later. The lamentation, written by Moshe Ma'alim, describes the troubles which befell the Jews in Jerusalem starting in 1542. In that year a plague hit the city, followed the next year by an earthquake which hit on Passover. Then locust covered the land, which exacerbated an on-going drought. The Muslims blamed the Jews, and repeatedly searched their houses for wine, the cause of all the troubles. This left the Jews with no wine for religious ceremonies. Finally the Muslims evicted the Jews from the city. The lamentation was written while the Jews were still in "Galut", and ends with a prayer that the Jews will return to Jerusalem soon. A hundred years later, we again hear a very similar story. Except this time, the problem was the Jews, not the wine. Henry Jessey was a British priest who believed the Second Coming would only occur if the Jews of Jerusalem would convert. He tells of several similar stories, the most descriptive is based on a letter written by the Jewish community. In 1639 there was famine in Jerusalem following a long drought. A Jewish convert to Islam convinced the Turks that the problem was the Jews: they were sinning against G-d. The Turkish governor, Muhammad Pasha, ordered the Jews immediately evicted from the city. The Jews begged (and bribed) the governor to give them three days. The governor agreed and decreed that in three days, if it won't rain, the Jews will be evicted and their belongings appropriated. Any Jew found in the city after that date will be executed. For the next three days, the Jews fasted, day and night. As the second day drew to a close, when they saw their prayers weren't answered, they decided they would rather commit mass suicide then stay at the mercy of the Turks. But before they did so, they asked the governor to pray at Zecharia's Tomb. The governor agreed and so on the morning of the third day the Jews went to Zecharia's Tomb and prayed and prayed. The day was a hot day, and the Turks already prepared the stones with which they intended to stone the Jews on their return. But come evening, after a day of prayer, the rains came. Within a couple of hours all the water holes filled up. The rains were so heavy, the Jews were forced to stay in the tomb throughout the night. And on the next morning, the Turks met the Jews coming back and blessed them and gave them gifts. The governor gave each of the rabbis a suit. The Jews were saved, until next time. The story of this miracle also appears in the book "Divrei Yosef" (PDF, p. 368), written by the 17th century Jewish-Egyptian historian Rabbi Yosef Sambari. It makes no mention of the Turks at all. A thousand years ago, during the Gaonic period, the Tishrei holiday period, culminating with Sukkot, was the highlight of the year. Pilgrims would flock to Israel to spend the holidays in Jerusalem. In those days Israel was ruled by the Fatimids, whose empire stretched from the Levant to Northern Africa. The Fatimids recognized the Israeli Gaon as the leader of all Jews in their empire. The Gaon was the head of the Israeli yeshiva, known as the Gaon Yaakov Yeshiva or the Eretz Ha-Zvi Yeshiva - the last remnant of the Sanhedrin. The main holiday events took place on the last day of Sukkot, Hoshana Raba. The Gaon would lead the people around the Temple Mount, and then the crowd made its way to the Mount of Olives. After they climbed the mountain, they circled it seven times. According to tradition, during the last three and a half years before the destruction of the Temple, the Shechina, the divine presence of God, moved to the Mount of Olives. There, God called on the people of Israel to repent. But the people did not repent, the Temple was destroyed, and the divine presence left Jerusalem. A monumental stone marked the spot where God looked over the Temple Mount. The Gaon would sit on this stone as he spoke to the assembled crowd. After a holiday sermon, he blessed the Jewish communities of the Diaspora, mentioning each by name, and those Jews who donated to the local community. He announced new appointments (semicha) in the yeshiva and throughout the areas under his jurisdiction. This was also the time when the Gaon pronounced a 'Herem' (excommunication) against those who strayed from the path. Specifically against the Karaites, for not following the Rabbinic Kashrut laws on eating milk and meat. In those days the Rabbinic Jews lived in the area south of the Temple Mount, while the Karaite Jews lived across the valley, in Silwan, on the south-western slope of the Mount of Olives. In what became known as the "Mount of Olives Declaration", the Gaon announced the dates of the holidays in the upcoming year. This Declaration emphasized the centrality of Israel for Jews everywhere. Pirke De-Rabbi Eliezer talks about this issue at length (ch. 8) and establishes that the calendar must be set by the Jews of Israel, regardless of their position. "Even if there are prophets abroad and laymen in Israel, the calendar must be set by the laymen in Israel." Though sometimes marred by conflict, strife and hardships, the Mount of Olives celebrations were a memorable and uplifting national event. It was a rare opportunity for Jews celebrate as a nation in their ancient capital. As one pilgrim witnessing the celebrations wrote his friend: "The congregation had the most beautiful holidays, like we've never seen before." Click on picture above for information on this year's Hoshana Raba events on the Mount of Olives.